The Ixon IQ Premium front battery light utilises a new radically designed special reflector with an integrated cooling system. The white light comes from a high powered LED that is used as an indirect light source creating a uniformly illuminated output which is very bright, wide and homogenous. The high power mode provides 80 lux output for five hours or 15 lux for twenty hours in the City Eco mode. Supplied with NiMH batteries and charger. Standard (BMD42) and oversized (BMD43) handlebar brackets are also available (seperately). Approved by German road traffic regulations. 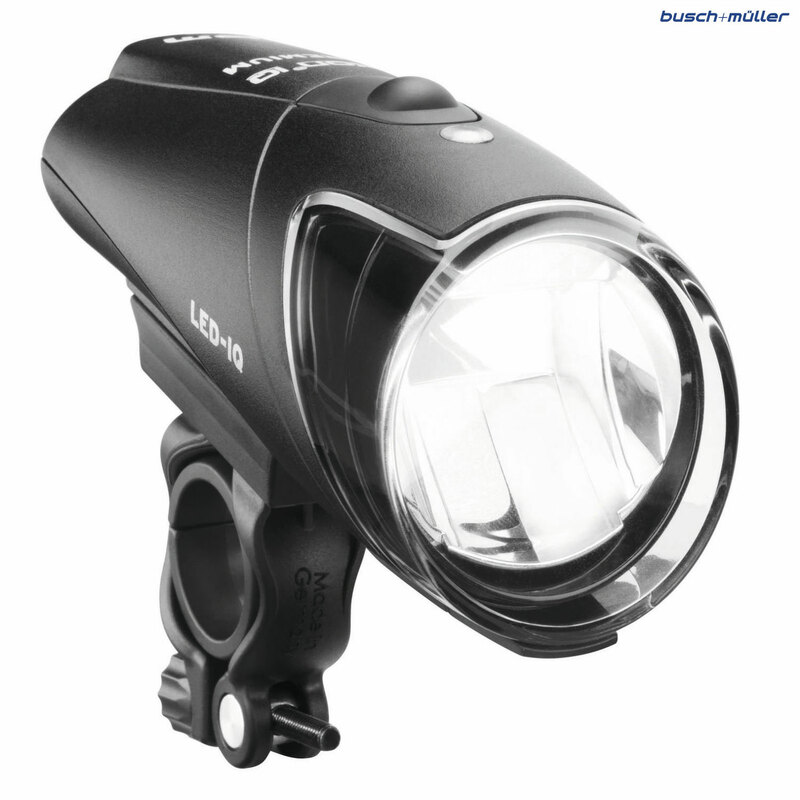 The lux output is measured at 10 meters from the headlight not just directly in front! The most remarkable technical feature of IQ-Tec is a radically designed special reflector with integrated cooling system. The light comes from a high powered LED that is used as an indirect light source. For this reason, there is no bulb or diode to be seen in the centre of the reflector. B&M aptly describe this concisely and clearly as "nothing but light". That is exactly what the cyclist experiences at night: The useable lighted area of the Ixon IQ is uniformly illuminated to a maximum extent and twice as wide as with conventional reflectors. Handlebar adapter with quick locking mechanism, rotatable and transferable means that the headlamp can be easily removed. Supplied with 4 NiMH batteries without memory effect and charger. The electronic system (90% efficiency) shows battery capacity, charging process and condition and prevents over charging. IQ-Tec Premium is the central technology for current front Busch & Muller lights. At its core is the revolutionary idea not to have the LED light source in the centre of the reflector. The complete reflective surface is used to focus and guide the light. Busch & Muller developed a special reflector - if you look into the reflector one only sees the metalised surface. When the light is turned on what takes its place is 'nothing but light'. ConsVulnerable to shock damage, a one metre drop onto a hard surface killed one. ProsBatteries rechargeable in the unit, can also be replaced. Excellent light to see and be seen. How to attach to cantilever fork mount? Hi - I bought this light along with SJS Cycles part number : 4667 to mount it to my fork. However, it appears I also need to replace the handlebar mount that came with the light with a mount that attaches to the cantilever fork bracket (4667). Can you point me in the right direction please. The part that you need is our item 50152. You should be able to just swap out the bracket and use the one you already have. When I brought my Raven from you I had her with a dynamo and sinewave revolution USB charger,Is there a cable that I can connect my sinewave to the light to allow charging please and if there is do you sell it please,thanks for your time. Unfortunately this light requires mains power for charging so there is not a charging cable available for it from a USB port like that on your Sinewave. Is it possible to mount this on the fork crown? I assume it might be possible to use a different bracket. I occasionally use a bar bag, and lights are obstructed. Busch and Muller do offer a fork crown fitting bracket as a separate item, these are SJSC part number 50152. How big/heavy is the charger it needs in grams? Is it USA voltage compatible? Is it waterproof? Can mount fit on an aero bar? what type of 'normal' garge store accessable batteries does it require? What are burn times when running on standard batteries? The charger comes as an EU plug with a UK adaptor, the combined weight for the two is 130grams. The light is water resistant, so will cope with all but the most extreme weather. It only comes supplied with a round clamp so would not be suitable for mounting to an aero bar. The light requires 4 AA sized batteries, if used with high quality standard batteries the run times should still be the same. Hi, yes this light will also run on standard batteries as well as the chargeable ones that it is supplied with. Yes this handlebar will fit both standard and oversized bars.